Fernando RubioS "Everything By My Side "
Performance Space 122 (PS122), Hudson River Park, and the French Institute Alliance Française (FIAF), New York's premiere French cultural center, present the U.S. premiere of Fernando Rubio's Everything by my side as part of FIAF's Crossing the Line 2014 festival. Everything by my side marks the U.S. debut of Buenos Aires-based, award-winning theater and visual artist Fernando Rubio. Performances will take place in English and Spanish. Argentinian artist Fernando Rubio moves fluidly between different modes of artistic expression. As a consequence, his work has an interdisciplinary quality. Everything by my side is part one-on-one theater piece and part spectacular site-specific installation. 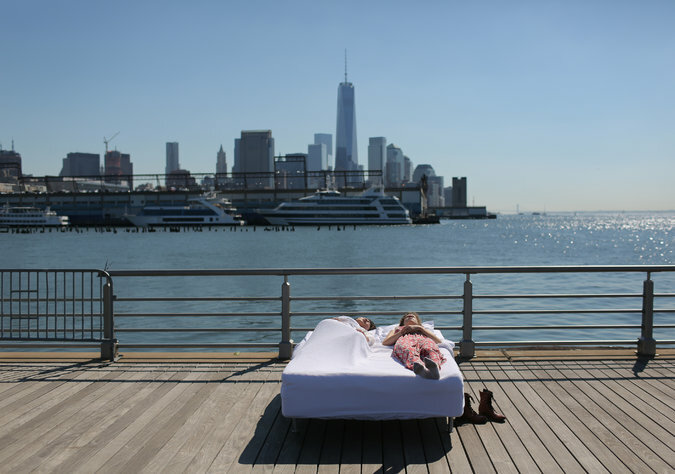 Seven white beds adorn New York's riverside skyline while seven actresses whisper vivid childhood memories to individual audience members. Everything by my side is an unforgettable and delicate search into the boundaries of loneliness and the interface between what is public and private. Performances of Everything by my side will take place this weekend, September 26th-28th between 2:00pm to 7:00pm (individual audience members are admitted at 15-minute intervals) at Hudson River Park's Pier 45 in Manhattan (1 train to Christopher St.). Tickets are $5 and can be purchased at ps122.org or by calling 212.352.3101. Fernando Rubio is a director, dramatist, actor, and visual artist from Buenos Aires, Argentina. Since 1998, he has been working on a wide variety of artistic works based on visual development and urban sprawl with his company INTIMOTEATROITINERANTE. He has presented his plays in many different theatrical and cinematographic international festivals in Argentina, Cuba, Brazil, Bolivia, Chile, Egypt, México, Spain, Italy, Portugal, France, Hungary, Ireland, Austria, Russia and Germany. He is a professor of the masters in performing arts at Instituto Universitario Nacional del Arte: IUNA. He is also the director of the Seminar on Research and Performative Actions, which holds courses for graduates of Escuela Metropolitana de Arte Dramático de la ciudad de Buenos Aires (EMAD). He has also taught seminars in dramaturgy. Many of Fernando's texts and plays have been translated into English, Italian, and French. Performance Space 122 (PS122), a not-for-profit, New York City East Village institution founded over 30 years ago, is recognized internationally for its presentations of contemporary theater, dance, music and live art. PS122 has developed a set of programs designed to re-establish the value of live performance, provide singular experiences for audiences that inspire critical thinking and sustain the creative process for artists throughout their career. Through partnering with peer organizations as well as contemporary institutions who share our belief in the cultural importance of live performance, PS122 currently commissions and presents artists in all disciplines in spaces all over the city during an annual fall & spring season and COIL festival in January. For more information, visit ps122.org. Hudson River Park, which extends from Chambers Street to 59th street along Manhattan's west side, is the longest waterfront park in the United States. This free, urban recreational oasis is home to award-winning skate parks, playgrounds, sports fields, gardens and nature exhibits, boating and maritime activities, art installations, and myriad year-round events that celebrate the diverse cultures and neighborhoods along its shores. The Park plays a critical role in protecting the Hudson River ecosystem, and though it receives no public operating funds from city, state or federal government, its development has transformed four miles of decaying piers and parking lots into a premier New York City destination for local residents and visitors alike. The non-profit, Friends of Hudson River Park helps to ensure ongoing sustainability by serving as the Park's primary source of fundraising, advocacy and support, working in concert with the Hudson River Park Trust, the city-state entity that oversees the design, construction and operation of the Park. For more information, visit hudsonriverpark.org. Follow us on Twitter and Instagram: @HudsonRiverPark, and like us on Facebook at www.facebook.com/HudsonRiverPark. The French Institute Alliance Française (FIAF) is New York's premiere French cultural center. FIAF's mission is to create and offer New Yorkers innovative and unique programs in education and the arts that explore the evolving diversity and richness of French cultures. FIAF seeks to generate new ideas and promote cross cultural dialogue through partnerships and new platforms of expression. Visit fiaf.org for more information. About Crossing the Line - Crossing the Line is the French Institute Alliance Française (FIAF)'s annual fall festival, presenting interdisciplinary works and performances in New York. The festival explores the dialogue between artist and public, and examines how artists help re-imagine the world as critical thinkers and catalysts for social evolution. Crossing the Line is initiated and produced by FIAF in partnership with leading cultural institutions. The festival's eighth edition takes place this year from September 8-October 20, 2014. Since its inauguration in 2007, Crossing the Line has cultivated an increasingly large and diverse following, and received numerous accolades in the press. The festival has been voted "Best of 2009," "Best of 2010," "Best of 2012," and "Best of 2013" by The New York Times, Wall Street Journal, Time Out New York, Artforum, and Frieze, with performances earning an Obie and several Bessie awards. The New York Times states, "For terrifically unusual, unpredictable, unnameable performance, we've come to expect a lot from ... the curators of the French Institute Alliance Française's interdisciplinary festival," and The New Yorker says, "This interdisciplinary festival, focused but not exclusively devoted to contemporary French culture, goes from strength to strength." Visit fiaf.org/ctl for more information. Four ladies leave their rainy and cheerless lives in post-World War I England for a holiday at a secluded castle in Italy. These very dissimilar women come together at the castle and find rejuvenation in the tranquil beauty of their surroundings, rediscovering hope and love during that Enchanted April. Come join the Elmwood Playhouse Relay for Life team at a benefit performance of Enchanted April on Wednesday, April 6th. Wonderful live theater, delicious refreshments, and the opportunity to help fight cancer – who could ask for more?! Theater opens at 7:30 PM, show starts promptly at 8 PM. Call or e-mail Debbi Fleckenstein (845-496-1635, badbunny63@gmail.com) or Nancy Logan (845-267-2543, Nhogan@nanuetsd.org) for reservations. at the Toronto Film and Tribeca Film festivals earlier this year. Tickets are $20 with discounts available for seniors, students and children. Be the first to see great foreign and independent films before they are released! See a film the way the critics do, without any preconceived notions, without the hype; meet critics, scholars and filmmakers after the screenings for discussions. In recent seasons audiences at The Center previewed Borat!, Brokeback Mountain, Slumdog Millionaire, Men Who Stare at Goats and The Girl With the Dragon Tatoo. Talk Cinema takes place on Thursday evenings, a perfect way to start your weekend early! CLICK to purchase tickets to individual screenings.